The Lower Klamath Project (Project) is located along the Klamath River, in Siskiyou County, California, and in Klamath County, Oregon. The nearest city to the California portion of the Project is Yreka, which is located 20 miles southwest of the Project’s downstream end. On September 23, 2016, PacifiCorp and the Klamath River Renewal Corporation (KRRC) filed a joint application with the Federal Energy Regulatory Commission (FERC) to: separate PacifiCorp’s Klamath Hydroelectric Project (FERC Project No. 2082) facilities into two separate projects (outlined below); and transfer ownership of one of the newly created project – the Lower Klamath Project – to the KRRC. Lower Klamath Project consists primarily of four dams and associated facilities, listed from upstream to downstream: (1) J.C. Boyle (Oregon); (2) Copco No. 1 (California); (3) Copco No. 2 (California); and (4) Iron Gate (California). Klamath Hydroelectric Project consists primarily of the following facilities, listed from upstream to downstream: (1) East Side (Oregon); (2) West Side (Oregon); (3) Keno (Oregon); and (4) Fall Creek (California). Also on September 23, 2016, the KRRC applied to FERC for permission to decommission the Lower Klamath Project in accordance with the amended Klamath Hydroelectric Settlement Agreement. Additionally, on September 23, 2016, the KRRC applied to the State Water Resources Control Board (State Water Board) for a water quality certification (certification) for the Project under section 401 of the Clean Water Act. On March 15, 2018, FERC approved separation of the Klamath Hydroelectric Project into two licenses, creating a new license for the Lower Klamath Project (FERC Project No. 14083). The Project primarily consists of the decommissioning and removal of four dams (J.C. Boyle, Copco No. 1, Copco No. 2, and Iron Gate) and associated facilities located in the Hydroelectric Reach (i.e., the Klamath River and tributaries from Iron Gate Dam to the upstream extent of J.C. Boyle Reservoir), to re-establish a free-flowing Klamath River and provide for volitional fish passage. The Project implements portions of the Klamath Hydroelectric Settlement Agreement, as amended on November 30, 2016. Additional information on the Lower Klamath Project and the Klamath Hydroelectric Project, including information beyond the scope of the State Water Board’s water quality certification process, can be found on FERC's elibrary. The Klamath River from the Oregon border to the Pacific Ocean is listed for nutrients, organic enrichment/low dissolved oxygen, and temperature. Iron Gate and Copco No. 1 reservoirs are listed for mercury and microcystin, a liver toxin produced by blue-green algae. The Klamath River from Copco No. 1 reservoir to the Trinity River is listed for microcystin. The Klamath River from the Trinity River to the Pacific Ocean is listed for sediment. The Klamath River from Iron Gate Dam to the Scott River is listed for aluminum. On February 18, 2010, PacifiCorp, several state, federal, and local agencies, non-governmental organizations, individual stakeholders and Native American tribes executed the Klamath Hydroelectric Settlement Agreement (KHSA). The State Water Board is not a signatory to, and is not bound by, the KHSA. 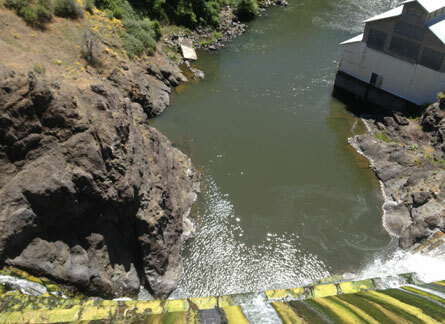 The KHSA seeks to return the Klamath River to free-flowing conditions and provide volitional fish passage in the portion of the Klamath River currently occupied by the Project’s dams and associated facilities. The originally executed KHSA proposed federal legislation that would have halted PacifiCorp’s Klamath Hydroelectric Project FERC relicensing process and granted the Secretary of the United States Department of the Interior the authority to determine whether removing J.C. Boyle, Copco No. 1, Copco No. 2, and Iron Gate dam developments was in the public interest and would advance salmon restoration. In 2016, the KHSA was amended to remove the need for congressional authorization, and to pursue dam removal through the FERC license surrender process. Four other settlement agreements were executed by a number of parties with varying interests in the Klamath Basin: 1) Klamath Basin Restoration Agreement; 2) Klamath Power and Facilities Agreement; and 3) Upper Klamath Basin Comprehensive Agreement; and 4) Klamath Power and Facilities Agreement. The KHSA and these settlement agreements, among other things: 1) provided a decision-making framework and process for removal of J.C. Boyle, Copco No. 1, Copco No. 2, and Iron Gate dam developments; 2) addressed water supply and allocation issues; and 3) set forth substantial water quality improvement measures for the Upper Klamath Basin.